YPT Preview: GIRLS WRITE OUT! YPT Presents: Girls Write Out! YPT’s 2015-2016 performance season begins with Girls Write Out!, a FREE, one-night-only staged reading of four plays and monologues written by young female playwrights. Professional actors bring to life tales of magic bracelets, superhero sisters, evil queens and more! Each of these playwrights wrote her piece in YPT’s In-School Playwriting Program. Ranging in age from 12-22 years old, they are among the youngest playwrights featured at the Women’s Voices Theater Festival! After the performance, YPT Founding Artistic Director Karen Zacarías will lead an engaging talkback with the playwrights. Karen is a resident playwright at Arena Stage, and her play, Destiny of Desire, is Arena’s contribution to the Festival! YPT will also be making a special announcement at Girls Write Out!, so join us and hear the good news! Click here to RSVP to Girls Write Out!, and reserve your (free) tickets in advance here. For more on the featured playwrights and plays, read on! KRYSTAL: My daughters who have betrayed me … Come out, come out! I said come out now. Don’t be afraid Laura, Lauren, Lauriann, Lauribell and Laurie. You should love me, I’m your mother. So come out NOW. LAURA: We’ve come out to battle you! KRYSTAL: Really? Battle your powerful mommy? LAURA: Come on girls. It’s time! Nevaeh Edwards’ Diamond of Destiny pits five sisters from the planets Lexaton and Vertex against their evil mother in a fight for the fate of Earth. Full of action, adventure and fun, this is one serious family feud! Nevaeh is in seventh grade in Washington, DC. She wrote Diamond of Destiny while in fifth grade at Amidon-Bowen Elementary School. Read more about Nevaeh here! ALEX: Hello? Is anyone there? RAPUNZEL: (Astonished) Who is it?! I’m here! Don’t leave! Stay! Just-just… wait a moment! RAPUNZEL: Um, this might sound odd, but I’d like it if you would just climb up my… rope. Yes, rope. It might look weird, but no need to worry, just climb as best you can. In Nora Foster’s Stuck in a Fairy Tale, teenage author Alex falls asleep and wakes up in a strange and fantastical land! Before she goes, she teaches Cinderella and company a few things about being a 21st century teenager. Nora is a student at Yorktown High School in Arlington, VA. She wrote her play while in seventh grade at Swanson Middle School. ELOISE: …You see this bracelet, wait, donde esta?! (Sees it on the floor.) Oh what a relief! Jakey estas bien? (Cuddles with bracelet. Pause.) Oh you think…? No No No No No Jake turn human K? JAKE: Oh Elly, you’re my best friend. I’m so happy I’m with you. ELOISE: Oh. Um. This is my bracelet…boyfriend. Bracelet-boyfriend. Bracelet-boyfriend. OK let’s say he’s a magical bracelet who just happens to be my boyfriend. Carmela Pascale’s The Magic Bracelet tells the tale of Eloise, a young bilingual girl picked on by a group of bullies. With the help of her magic bracelet, she turns the tides on the bullies and teaches them a lesson they’ll never forget! Carmela is in ninth grade at Bell Multicultural High School, and is a member of YPT’s Student Advisory Council. She wrote The Magic Bracelet while in fifth grade at Bancroft Elementary School. LAUREN: Hullo yer Majesty, what do you need? LAUREN: (Sarcastically) Um… I think so. QUEEN: Not funny dear. Now, child, I read your letter, and it’s very, interesting… And I have many questions for you to answer for me. QUEEN: First off, why do you want me to change?! QUEEN: I mean, isn’t it perfect here? Don’t answer me, because it is. In Anderson Waltz’s Wish for Light, the selfish Queen has gotten rid of the Sun. Can clever Lauren convince her to bring it back again? Find out in the WORLD PREMIERE of Wish for Light! Anderson is a middle school student in Washington, DC. She wrote Wish for Light while in fifth grade at Watkins Elementary School. Monday, October 19 at Sidney Harman Hall! 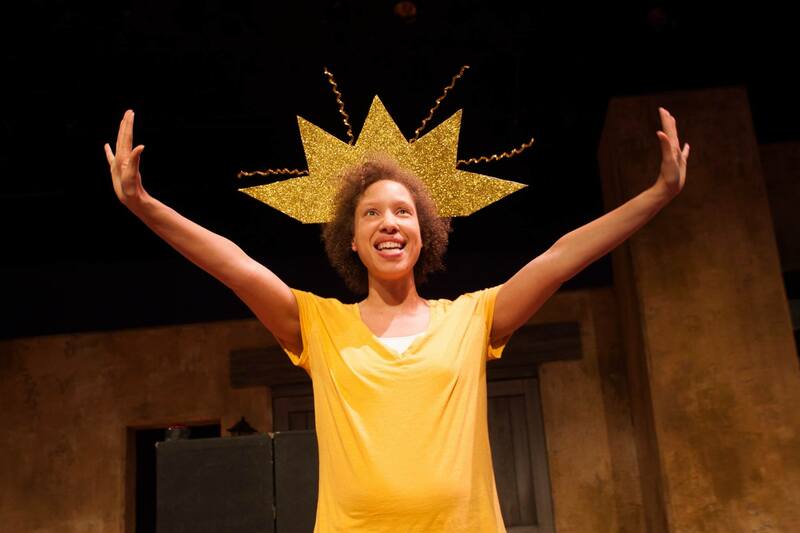 Posted on September 30, 2015 September 30, 2015 Author yptdcCategories UncategorizedTags 2015-2016 Season, arts education, empowerment, feminism, girl power, girls, Girls Write Out!, performance, playwright, playwriting, production, staged reading, students, theater, Washington DC, women, Women's Voices Theater Festival, world premiere, Young Playwrights' TheaterLeave a comment on YPT Preview: GIRLS WRITE OUT! This season, as we celebrate our 15th Birthday, we’re inviting you to enter our work in a whole new way, to gain your insights into the work by sharing our own and asking you to engage with us. In the coming weeks and months all of us in the company and on staff will be posting entries about the work that we’re doing, from programs and specials projects to development and production. We hope you’ll enjoy this bird’s eye view of how we do what we do and that it’ll inspire you to join us in helping to give students the tools they need to engage the world. Visit often to catch up on what’s been happening and stay connected with what’s next. Welcome to our community, our family, our company. We hope to see you again soon.